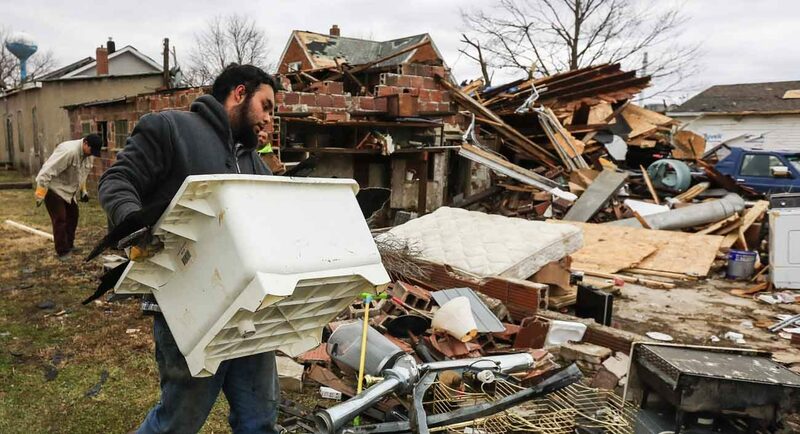 OTTAWA, Ill. (CNS) — Deadly and destructive tornadoes that moved through regions of the Diocese of Peoria on the eve of Ash Wednesday have led to extra prayer and charity in the first days of Lent. At Masses in his parishes the weekend of March 4 and 5, Father Tony Fevlo invited the faith communities to embrace this special Lent. The parish’s stewardship committee was to meet to begin discussion on how to put money collected to best use. A regular collection that the committee takes up during Lent netted three times the usual amount when it was announced proceeds would help tornado victims. The priest, who is a member of the Society of African Missions, also serves as administrator of St. Patrick Parish in Ottawa. He also oversees St. Mary Church in the village of Naplate, just southwest of Ottawa. St. Mary Parish was merged into St. Francis of Assisi in 2013, but the church has continued to host a Sunday morning Mass. But St. Mary sustained structural damage from an EF-3 tornado that struck just before 5 p.m. Feb. 28. As a result, Masses and other liturgical activities have been suspended indefinitely. Two large trees in front of St. Mary Church were uprooted. The winds broke windows in the church as well as the adjacent rectory and parish hall. Many roof shingles are gone. Most alarming, said Father Fevlo, is that beams that support the church ceiling were lifted from the floor and no longer rest on their foundations. Cracks are visible on some of the walls and there was water leakage. The National Weather Service confirmed three tornadoes in the Ottawa area that evening. The one that touched down in Naplate and also stretched into Ottawa had winds that reached 155 mph. The National Weather Service reported 22 tornadoes ripped through Illinois, Missouri, Tennessee, Indiana and Iowa. Two people in Ottawa were killed when an uprooted tree fell on them, and more than a dozen people with storm-related injuries were treated at OSF St. Elizabeth Medical Center in Ottawa. St. Mary Church and rectory were built in 1963. A parish center with a meeting hall and CCD classrooms was added in 1984. The rectory is unoccupied. There was much debris in a bedroom where the windows were blown out. Father Fevlo was at St. Patrick Church’s rectory, further north in Ottawa, when the storm hit. “I went to the basement,” he recalled. “The wind was too much, and the power went out.” By the time the storm passed, Father Fevlo’s phone was already ringing regarding the damage in Naplate. He immediately went to the village but was not allowed into the affected area for two hours because of gas leakage concerns. Dermody is editor of The Catholic Post, newspaper of the Diocese of Peoria.